Liz Shephard is the Chief Executive Officer of LifeCity, a “for-benefit” company that makes social and environmental impact profitable for business. 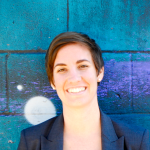 Liz is trained as an energy rater, water policy analyst, LEED Green Associate, and facilitator. After graduating with honors and distinction at Carleton College, Elizabeth was hired by her college as an Environmental Studies Associate to serve as the school’s sustainability coordinator, where she also built connections to the city of New Orleans. Originally from the Gulf Coast, Elizabeth moved to Louisiana to teach Earth Science and worked in the environmental non-profit field for nearly 3 years. Daughter of two independent business owners and as a previous steering committee member of Social Entrepreneurs for New Orleans (now Propeller), Elizabeth is passionate about making business sustainable. She leads the Green Chamber of Commerce Green Committee and serves on event committees for greening the Superbowl, NCAA events, and other special conferences like the USGBC Green Build Conference.Recently, Elizabeth was chosen as one of the top 50 Business Women of the Year by CityBuisness, a local New Orleans newspaper.